The magic begins when Laura and her family–brothers James, baby Deborah, and her parents–move to a country house in Connecticut. There is a well in the yard, and Laura is the kind of girl who believes in making wishes. Magic or Not? is a bit different than all of the other Tales of Magic books, but it is still quite enjoyable and a great addition to the series. 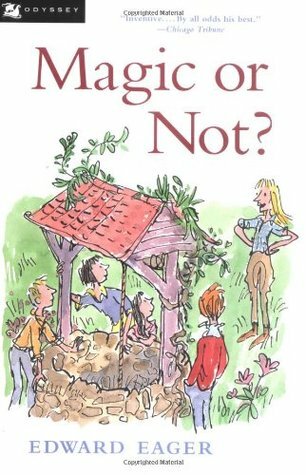 In this novel their are four children, later on five, who go on what they believe to be magical adventures given to them by a wishing well. However, they are never sure whether or not it really is magic or if it is just a coincidence. This is what made the story interesting and kept it a bit more real, like how children pretend when they play, and don’t actually go on magical adventures. However, even though I like the book, I didn’t really like this part of it because when they go on actual adventures to different places or times it makes the book so much more interesting. Instead, they just explore their new town and decide to help people in need. I did like how everything they did and all the people they helped seemed to be connected together. Most of the characters were enjoyable. Laura and James are the two main characters. They are twins who just moved into their new house, they are both really smart and love books, especially Half Magic. They eventually meet Kip who is their neighbor. He loves popsicles and was always eating one, at least at the beginning of the book, then no mention of them later on, which was weird. The children also meet Lydia, whom Kip doesn’t really like at first because she seems kind of weird. She is their other neighbor who lives with her very artistic grandmother, she is mysterious, scared of horses, but rides one anyway, loves reading as much as Laura and James, and turns out to be a pretty good artist. I was amazed how much we learn about each of the characters, especially in such a short book. Everyone was well described, had their own personalities, and was memorable. I really like this aspect of the book because it helped to make it better even when the story wasn’t my favorite. I did enjoy the book, but it wasn’t one of my favorites of the series. The characters were what made this book! If you love the Tales of Magic series or love fantasy, then I would recommend this book to you! It’s a fun book for kids!